No man enjoys being nagged by a woman. No woman ever wants to be called a nag. However, in spite of the best attempts by some of the most mature men and women, many relationships end up having to deal with this ineffective cycle of communication! Why does it happen? What does she really want? Why does it drive him absolutely insane? How is he contributing to the problem? Men and women usually view nagging very differently. To him, nagging feels like an unbearable, bothersome, never-ending, unstable, and persistent chipping away from the simple peace he desires to have in the relationship. To her, nagging is not nagging at all. It is, instead, a heartfelt attempt to openly and freely communicate in order to solve a problem or barrier in the relationship and then quickly get back to a state of peace. Both the man and woman want the same thing. They desire peace in the relationship. However, one is taking immediate and deliberate action to push a resolution in order to obtain peace. The other does not feel the same barrier and is, instead seeking to experience a continual peace and then resolve the issue in time. However, there has to be balance in the relationship. The couple must work together, in the way and time that works for them, to be at peace and continue in a happy, healthy, and stable relationship that works for both. 1. Repeating conversations – If you continue to rehash the same conversation over and over again that becomes nagging. This is an indication that you have not yet been honest about the true root issue. Take time alone to evaluate the problem and identify the source of your pain. Then, work with your partner to resolve that issue. 2. Feelings of resentment – If you find yourself feeling resentful towards your partner, you may find yourself being overly critical. This leads to an atmosphere of nagging. Again, you must work to identify the basis of your negative feelings and resolve those. Sometimes you will need to resolve these things separately and on your own, other times it will be something you and our partner must work on together. 3. Not wanting to spend time together – If you or your partner do not desire to be around one another or just have good conversations, this is certainly an issue. Nagging is not always the reason, but it can certainly be one reason. No one desires to willingly go into a situation where they know there will be hounding and arguments. Try to find a way to remember the things you most enjoy discussing; what drew you to one another to begin with. Also, try praying together. Be sure to pray with an open heart and mind, talking to God sincerely. 4. Shutting down – If your partner seems to shut down every time you begin to speak, it may be because they have grown to anticipate nagging and they are just no longer willing to engage in it. They don’t see any point of resolution through the conversation. Many times, this may be a misunderstanding; the partner may shut you on a false assumption of what you were going to discuss. However, this is still an opportunity to improve. Focus on living according to the peace you desire to have, understanding that one conversation does not determine whether or not you can have peace. True love will not allow an issue to forever go unresolved, especially if it hurts you. Pray for your partner and allow God to work in their heart and yours. Ask God to show you both how and when to discuss the issue. 5. Being passive aggressive – If you are communicating in a way that takes subtle digs and jabs at your partner, then you are nagging. This is an immature and selfish form of communication. You must learn to be clear, concise, and direct in your communication. Also, once you say what you mean, you should not feel the need to continue repeating it over and over again. Don’t insult the intelligence of your partner. Give them time to digest your words and love you enough to respond accordingly. 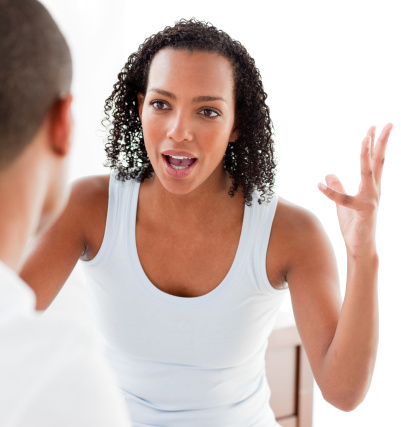 Although nagging is most commonly attributed to women, men can be guilty of it as well. It is critical for couples to rise above issues and be selfless; seeking to resolve issues in a way that benefits their partner and the relationship. Nagging, shutting down, etc…. are all selfish tendencies. A relationship is not all about any single person. Two people have to learn to walk together and agree as one, else the relationship can fail in the face of other trials and temptations. Learn to communicate effectively and grow together in order to be a stronger vessel for the kingdom of God. Have realistic expectations of your request and is the request worth ruining the relationship?